If you’ve owned a home for a while, you know that water entering the home can be at least a hassle and at worst a cause of major destruction. Not only should keeping water from sneaking into those tiny cracks and crevices be a priority, it could make the difference between owning an asset and owning a money pit. 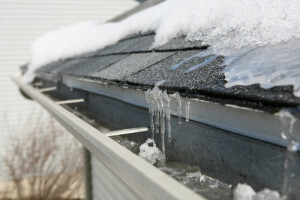 One of the primary ways to protect your home from undesirable moisture is installing gutters. Most people think that the sole purpose of rain gutters is to direct water coming off the roof toward downspouts to keep it from dripping on their heads over doorways. The value of gutters is much more that that, however. Not only that, water moving off a roof can roll under the drip edge of the roof and seep under soffits and eaves, weakening the wood. It seeps between the joints or masonry and the framework, exposing your home to mold and other damage. If subject to freezing temperatures, the water inside the wood freezes and swells, causing internal damage to beams, joists and framing. Preserve overhead garage doors and exterior doors from damage. Stabilize soil and the home’s foundation. Prevent sidewalks, patios and driveways from settling and landscaping from erosion. Protect basements and crawlspaces from flooding. There is much more to gutter installation than simply hanging them from the eaves. In order for gutters to function correctly, they need to have the correct pitch. In general, the gutters should drop one inch in slope for every ten feet in length so that the water runs toward the downspout rather than pooling up in a low spot. Check your gutters to make certain they are correctly sloped by placing a hose at the closed end of your gutter and allow the running water to gently flow into and through the gutter. Water should only flow toward the downspout. Make certain that your downspout actually direct the water away from the structure of your home. Optimal would be extending the terminal end of the downspout several feet away from your home’s foundation or onto a concrete or vinyl downspout extension. Alternatively, install underground drainage that leads away from your home’s foundation to the street gutter, or to a drywell. Sometimes, the end of the downspout gets damaged or smashed. When this happens, water and debris can back up into the downspout and gutter, rendering them useless and setting up your home for potential damage. Make certain gutters are clear of leaves and debris. Schedule cleaning gutters into your spring and fall schedules. After a major storm, even if your roof has not sustained major damage, clear shingle residue from gutters to avoid problematic buildup. If you’re looking at a home to buy, make sure the home has gutters installed. If you want to increase the value of a home you’re selling, installing gutters gives buyers peace of mind about potential water problems.